Courses based on classical Buddhist texts and commentaries are held twice weekly - Wednesdays at 7 pm and Sundays at 10 am. Subjects include the Lamrim or graduated path to enlightenment, the bodhisattva path, lojong or thought transformation and the perfection of wisdom teachings. 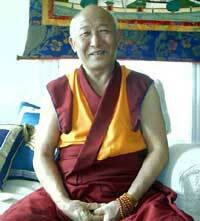 During the winter and spring of 2009, Geshe Tenley (Venerable Ngawang Tenley) teaches while resident teacher Geshe Tsulga recuperates from an illness.